This is not the regular palindrome finder. Given a string, we should be able to print all the possible palindromes. Let me quickly give a brief example. If you could see there are two possible outcomes in palindrome, one is odd and other is even. My initial solution was very worse. What I actually did was did a permutation/combination of all the possible texts and send it to a palindrome() method. It will run in the worst possible time. However, there is even a simpler solution available. First do a parse for odd occurring palindromes followed by even palindromes. For odd palindromes run through each character from the text. For each character, see if there the pre and post occuring characters are equal, if they are equal print them and do the same for the next levels. In the following example shown below, assume you are at 'y' and see the previous and next characters are equal. If they are see further more until the palindrome functionality ceases. Print all of them whilst this time. Thats it. Do the same for all the characters. Since there is no meaning in doing this for first and last characters, we can very well omit them. Stack is a data structure that follows the simple FILO (First In, Last out) or LIFO (Last In, First Out) rule. Imagine a real world stack where you arrange Notebooks one over the other. The first notebook you insert will be at the bottom and that will come only at last. The implementation of stack can be done in many ways. We are going to see how to make use of a Singly Linked List to the use. We can implement stack using a Linked List in the below shown ways. One is to have the END node on top and other is to have the START node at the top. If we recollect the singly linked list data structure, insertAtFirst() is an operation which can be done in O(1) time and insertAtLast() will take O(n) time (because we need to traverse till the last node). So, we can make use of the second method to use stack using linkedlists. The three methods that stands out for a stack are pop(), push() and peek(). push() - push elements into a stack. We will use the insertAtFirst() method of LinkedList. Throws StackOverflowException when the stack is full. pop() - remove and returns the top element from a stack. We will use the removeAtFirst() method of LinkedList. Throws StackEmptyException when the stack is empty. peek() - return the top element from the stack without removing it. We will use the getFirst() method of LinkedList. Throws StackEmptyException when the stack is empty. The java code for this looks very simpler. We will make use of the existing SinglyLinkedList class that we have used before. The objective for this program is to find the kth node from the last without actually finding the size of the singly linked list. For this problem, we need to have two pointers, lets call them FAR and NEAR. We need to initialize them by pointing them to the start. After doing that, move the FAR pointer 'k-1' times ahead. After moving that run a loop until FAR becomes null, amidst that increment both FAR and NEAR pointers. The below picture shown is done for k=3. In step1, we are moving the pointer k-1=2 times. After that by moving parallely FAR and NEAR pointers, we can find the kth element from the last by getting the data from NEAR pointer. The Java code for this simple program is given below. To try the below program please copy this class as well. A squad of robotic rovers are to be landed by NASA on a plateau on Mars. This plateau, which is curiously rectangular, must be navigated by the rovers so that their on-board cameras can get a complete view of the surrounding terrain to send back to Earth. A rover's position and location is represented by a combination of x and y co-ordinates and a letter representing one of the four cardinal compass points. The plateau is divided up into a grid to simplify navigation. An example position might be 0, 0, N, which means the rover is in the bottom left corner and facing North. In order to control a rover, NASA sends a simple string of letters. The possible letters are 'L', 'R' and 'M'. 'L' and 'R' makes the rover spin 90 degrees left or right respectively, without moving from its current spot. 'M' means move forward one grid point, and maintain the same heading. The rest of the input is information pertaining to the rovers that have been deployed. Each rover has two lines of input. The first line gives the rover's position, and the second line is a series of instructions telling the rover how to explore the plateau. The position is made up of two integers and a letter separated by spaces, corresponding to the x and y co-ordinates and the rover's orientation. Each rover will be finished sequentially, which means that the second rover won't start to move until the first one has finished moving. The solution follows. You may download the complete program here. TestMain would be the point of entry. This is a well known program but quite frequently asked. Given an integer, reverse it. There are many ways to do that. And the ideal way is to use an extra variable and using a loop. The program is very simple, please find it below. This problem is quite largely discussed and is very famous for its various ways to attack. This can be constrained in time and in space. The most primitive way of attacking this problem would yield an solution that runs in O(n2) time. Let me define the problem clearly. Given an array of size n and a number X, you are supposed to find a pair of numbers that sums to X. Only one pair would be enough. Lets see how we can find the solution for this in O(n) using a HashSet. Yes, HashSet is a costly data structure to use, but lets consider this primitive just due to the linear order it provides. We shall improvise on this problem in space domain using fancy sorts and those we shall see in the coming posts. We already saw how to find the Least Common Ancestor for a binary tree. The problem gets a bit tricky when the node structure is like this. If you look at the above structure, there are no parent nodes and the given tree is not a Binary Search Tree which makes the problem all the more complicated. To attack this problem we need to follow the below steps. The total cost for this program would be - O(n) + O(n) + O(logn) + O(logn) = O(n). Now for the java code. I am going to use the Trace Algorithm from the previous post for this solution to make life easier. Hope you were able to learn something. //Using the path tracer, find the path of two nodes in 2*O(n) time. //All that is left to do is to find the common parent now. The problem is simple. Given a node, we should be able to show the path from the root to that node in a BINARY TREE (NOT A BINARY SEARCH TREE). This solution would help us how to traverse through a binary tree. Here I am going to do an inorder traversal. More on traversals on a binary tree can be found here. 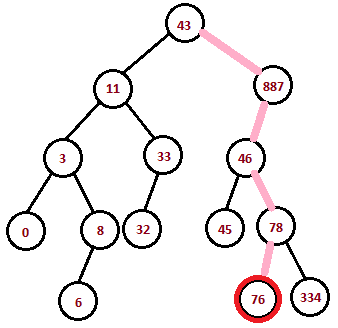 Consider the following binary tree, we can see the path to be found and the node supplied to find it. We will be provided with a tree, its root and the node to be found. 76 is the item that we need to find. 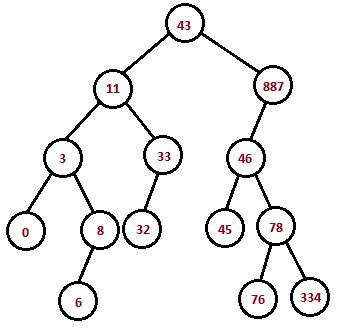 Although the example looks like a BINARY SEARCH TREE, we are not going to use the binary search tree way to find 76. So, we would have no other way than doing either of inorder, post-order or pre-order traversals. I was having problem in returning from the recursive method in a proper manner. Thanks to the help of stackoverflow.com and its code gurus, I was redirected to the right path. This is a very common data structure problem, to find the center of a singly linked list. And the following is the famous solution. I have tried to give a comprehensive code coverage for this problem. The list count can either be odd or even. If its odd, we have only one value as the center and two for even case. I have covered both in the following code. Please do take a look at the SinglyLinkedList class for this program for reference. This is how it works, there will be two pointers, one jumping once and another one jumping twice. When the double jumper ends/terminates, the single jump fellow's data would be the center. Now that we have seen how a binary tree is structured and doing a search operation over the same, lets look at how we can traverse over that data structure. There are three types of traversals that can be done. 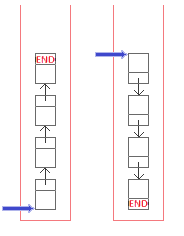 In-order traversal follows the route VISIT LEFT / VISIT ROOT / VISIT RIGHT. For a given binary tree, first visit the left most node and if no left node exists, visit the root and then visit the right. By this fashion traversal can be done. As a matter of fact, a simple In-order traversal in a binary search tree would give the sorted result! How cool is that!? 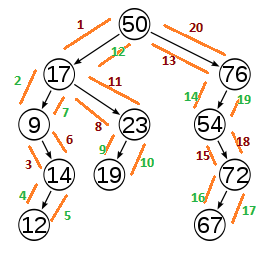 If you take a look at the above picture (yes, it looks a bit crowded, but you can track the numbers from 1 through twenty and the green ones are the values that we take), we start the process from the root and end up in the root. First search for the left most node. If there is none available take the immediate root and apply the same algorithm to the current node's right node. What i say may be a bit confusing but follow the numbers, you'l know. Pre-order traversal follows the route VISIT ROOT / VISIT LEFT / VISIT RIGHT and the Post-order traversal follows the VISIT LEFT, VISIT RIGHT, VISIT ROOT. For the above given example, the sequence that we get for various traversals is listed in the table below. You can cross-check it for yourself. 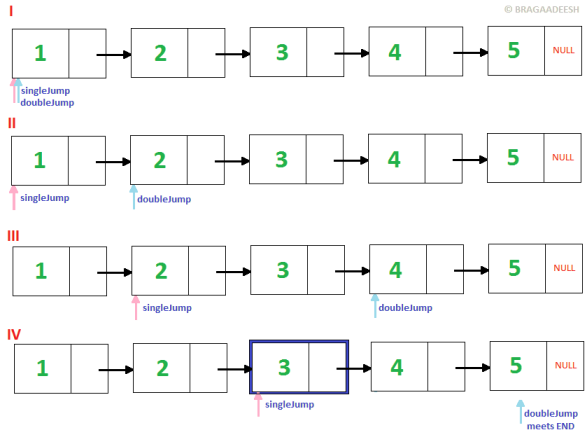 In order traversal's application is clearly visible in this example (it gives a sorted list). Pre and post order traversals too have some powerful applications which we will look in the following posts. Although this is totally not related to Java or data structures for which this blog is intended to, I thought I would post this here anyway. This is my project work that I did during college. This implements Columnar Transposition technique of encryption using TMS 320C 5402 which is Digital Signal Processor. Full project report for this can be found here (you may require to sign in using your Google Account). License would be free to distribute and use anywhere. To implement the columnar transposition technique, a famous encryption technique on the input message using TMSC5402. Here the message or plain text is encrypted into a decrypted message using the random arrangement of the plain text. The arrangement of the resulting cipher text although seems random to the hacker (unauthorized intermediate person trying to read the message), it is in certain order and that order is been decided by a key. The key is simply numbers from 1 to ‘k’, where ‘k’ is the key size. The numbers are in some random order, mostly decided by the user or the sender. A simple example is shown below. This is the simplest form. As we can see the decryption can be done using the secret key that we have used for the encryption. This might look simple since we have used a small message. But this message is almost impossible to hack when we use rows and columns and increase the key size. Lets see another example which could explain it better. Here we have used the ‘$’ symbol instead of spaces. Now the encrypted message is impossible to hack. We can even apply again this method to the encrypted message to make it further random. In this case we can use the same key or other key. Same key can be used for simplicity. Decryption is as simple as encryption. Just use the same key and rewrite the indexed values. Lets do the decryption for the Cipher text 1. Now the original table can be formed using the indexing technique as said earlier. The columnar transposition technique of encryption is easy to understand but still complex to break by brutal force attack or cryptanalysis. This method get enhances as the key size is increased and by re applying the same technique. The hacker or the intermediate person cannot break this code unless otherwise he knows the method. Even he knows the method, it is still impossible to decrypt the encrypted cipher text without the knowledge of the key and the length of it and the no. of columnar transpositions that were made. As we’ve seen, we can enhance this technique by applying to the encrypted text over and over. In that case, we have to decrypt that many times we have encrypted and use the keys in the reverse order (FILO). This technique can be implemented in the 5402 processor. We can enter the text message from a starting address say 3FFFh. The key is got from the user or is specified in some predefined location rather than getting in the run time. 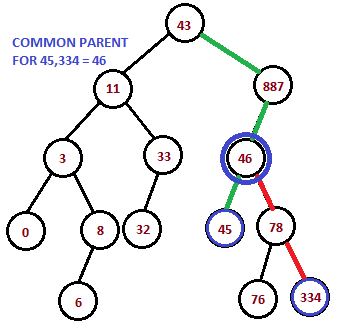 Then the transposition technique as given above is done using the instruction set available and is stored from say some starting address 43FFh. The data is transmitted serially(assumption) and is retrieved in the same manner. The decryption is done in the same scale. Here we assume that the received message is error free and is available from the location 43FFh. The decryption is similarly performed as encryption with slight difference and is put in some other location. We might be using a special symbol in order to mark the end of message. In this method we will be implementing depth1 columnar transposition for simplicity and ease of use.